Along with a billion other people this week, I've had my eyes glued to the Olympics ever since the overblown (and amazing) opening ceremony on 8/8/08. And like a billion other people, I've cheered for the athletes and their accomplishments, rooting for my home country and other outstanding athletes from across the globe - the flawless Jingjing Guo of China, the ecstatic Richard Thompson of Trinidad/Tobago, and the Canadians (because our neighbors to the north deserve to win some medals too). And I've been rooting for Michael Phelps. I can't help but like the guy. Whether or not he is the greatest Olympian of all time is debatable, but it's hard to argue that he and his relay teammates have performed brilliantly in these games. I like his laid-back, slightly awkward personality. I like watching his exuberant family members cheering from the stands. And most of all, I like that he's gotten better with age. There's been a lot of controversy this year over the age of the extremely young-looking female Chinese gymnasts. In 1997, the minimum age for gymnasts competing in the Olympics was raised to 16, to help protect the mental and physical health and well-being of the youthful athletes (many of whom, otherwise, would likely be pre-pubescent - some of whom still are). There is a history of age-falsification in gymnastics - the younger and tinier a gymnast is, the more fearless and flexible they are. I will admit that watching the really young athletes just doesn't do it for me. They may be talented and fearless, but they're just kids. With age comes maturity and grace under pressure and a real sense of sacrifice and dedication. A sixteen year old may feel the weight of her country's expectations on her shoulders, but she has few other responsibilities - go to school, train daily, hang out with friends. 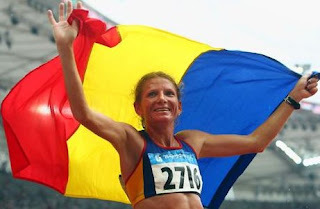 I love the Dara Torres(es) of the Olympics (41 year-old, three silver swimming medals in Beijing) and the Constantina Tomescu(s) (38, Romanian winner of the women's marathon), and the male Chinese gymnast Wei Yang, who at 28 years-old (twice the age of China's female gymnasts), will leave the games with two gold medals, including the coveted gold for all-around. These are the exciting athletes - the grown-ups who have made choices and sacrifices, who have families and responsibilities, who are aging but who prove that you don't have to retire at 17 just because the kiddies can jump higher or run faster. You can fight and win and get better with age. I'm happy for Michael Phelps and his eight golds at this Olympics. And I'm even happier that this is his third Olympics and that he has also gotten better with age - from zero medals at 15 to six at 19 to 8 golds at 23. And if he decides not to retire and fights for more golds in London in 2012, I'll be rooting for him then too. So what is the peak age of physical perfection? I recently started playing with the Wii Fit, and each day I take a body test measuring my weight, balance, and agility, after which I am presented with my "Wii Fit Age". 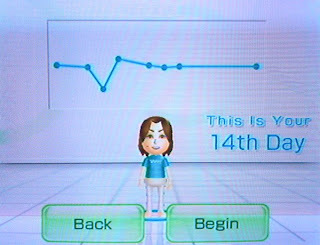 After a recent round of higher-than-average agility scores, I was awarded the Wii Fit Age of 20. And what is wrong with the Wii Fit Age of 23, might I ask? Was I honestly healthier and fitter as a 20 year old than I should be now? Did I pass my prime and enter physical retirement before I was legally old enough to drink? I honestly hope that at the ripe old age of 23 (and Phelps' senior by 5 days), I still have a few good physical years ahead of me.